What do you see happening in 2019? Everything? Anything? What do you mean, you daren’t look? Here’s one of the little social media adverts I art directed for Moorfields Eye Hospital. I tell you this having just cleaned my inexplicably dirty glasses for the twentieth time today <sigh>. Spent time today perusing some of the wedding stationery I’ve designed over the past few years, appreciating how it provides great opportunity for creativity and exploration of more unusual production techniques, but mainly for the joy of designing something totally unique for great old pals. Fi and Tom own a bespoke kitchen design company, specialising in plywood construction, so it felt only appropriate to include this aspect in the design. We etched the type into white wax coated 3mm ply, each invitation unique in pattern. 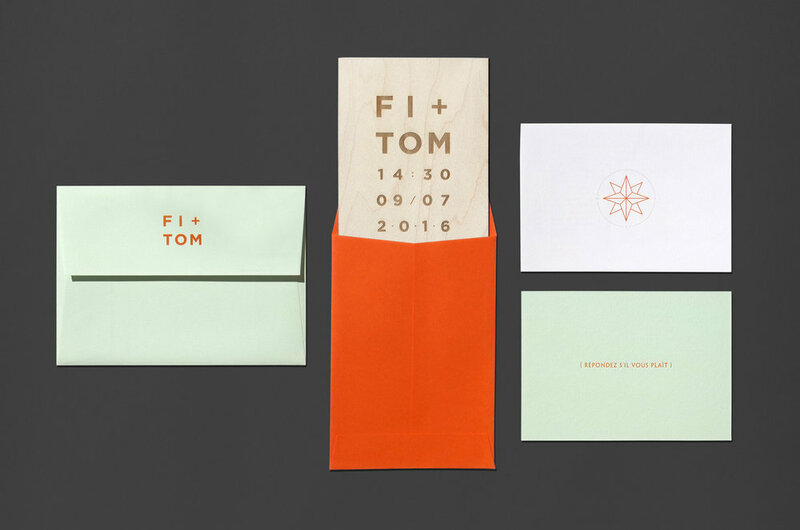 Colorplan Pistachio and Mandarin compliment, with a particularly satisfying matt orange foil emboss on the RSVP card – YUM. BTW if you are thinking about redesigning your kitchen do check out Witlof. 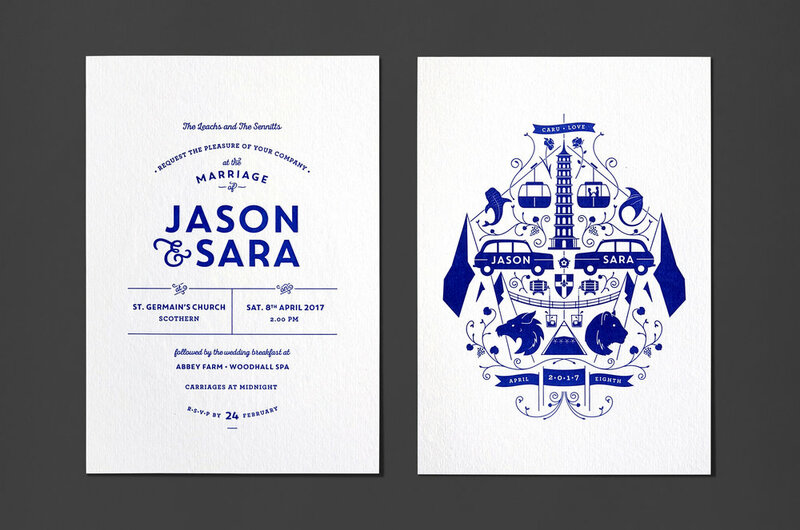 Sara and Jason expressed a desire for a kurbit-inspired design – a symmetrical merging of elements significant to them as individuals and as a couple. 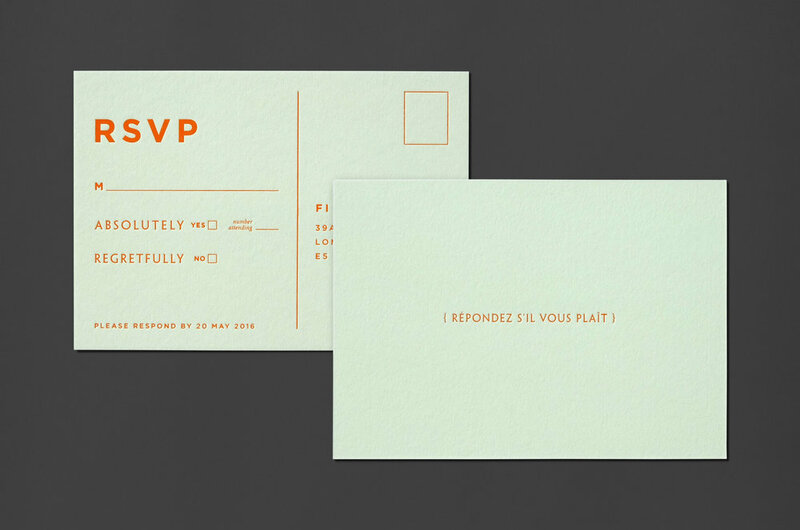 The invitations saw the deep, inky Pantone Reflex Blue letterpress printed onto a tactile, spongey 638gsm cotton board. To echo the colours on the day, Colorplan Mandarin envelopes were chosen, hints of which were brought in throughout the stationery set. 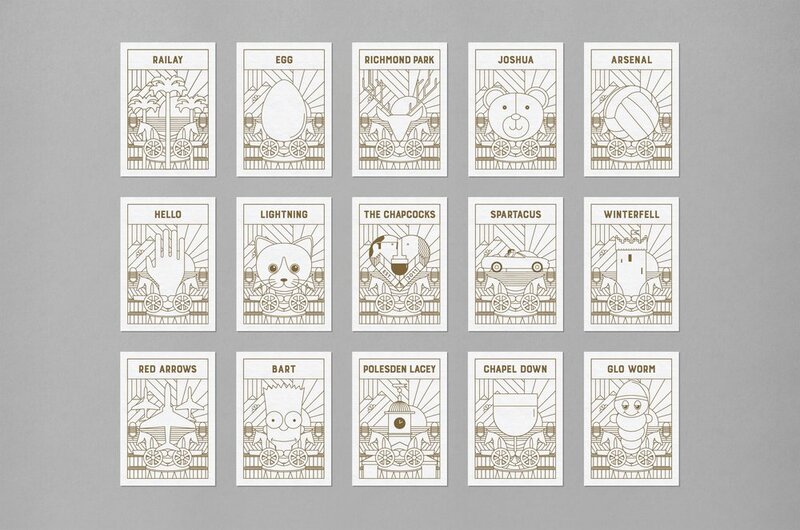 When The Chapcocks, aka Alexis and William, got hitched back in 2015 they asked for a design the encompassed their hobbies and interests, they also spoke about the possibility of a ‘wedding logo’. 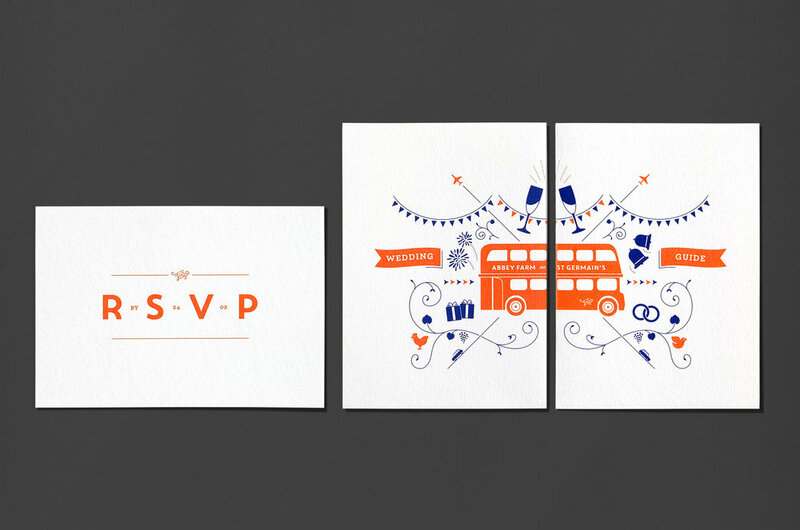 We took that theme and went for it – invitations, RSVPs, table names, menus, bus names (! ), race cards, thank you cards, personalised engravings onto specially commissioned sculptures (that’s right). This wedding was branded. 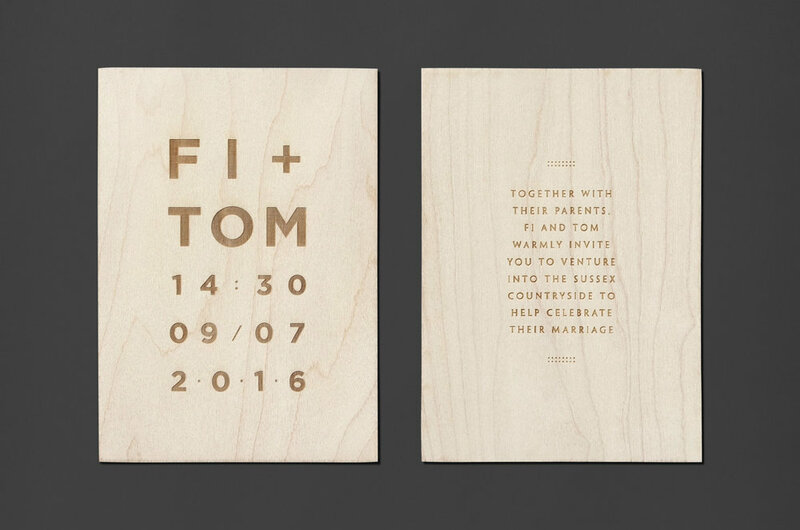 As for the production, we used Colorplan Bright White throughout with a Pantone metallic gold ink. Nice. 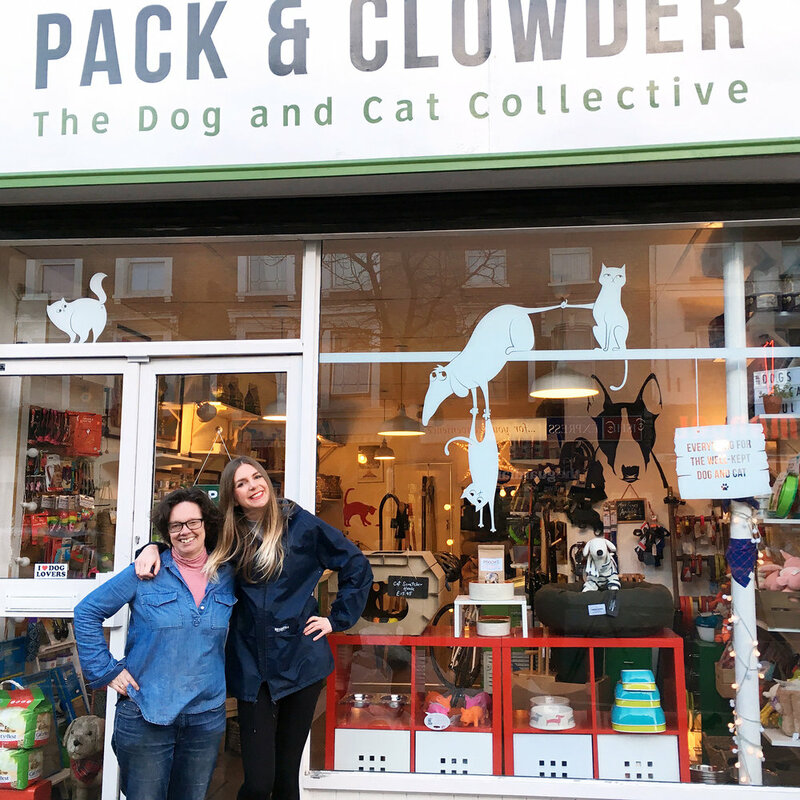 What better way to spend International Women’s Day last year than seeing the the collaboration with Jackie (owner of Pack & Clowder – the most excellent pet shop in Hackney) come to fruition?! I’d been hawking my greetings cards from the shop for a while when she asked if I had any ideas as to how we might bring the window to life. Jackie likes funny, and a bit weird, definitely not ‘cute’. I was fully onboard. I wanted to create something a bit cheeky, that interacted with the products on display, so started doodling and came up with a plan! The animals should conspire to steal something from said display! A depiction of some reluctant (see the repulsed expression of the cat having to hold the poor dog’s tail) and ingenious teamwork! 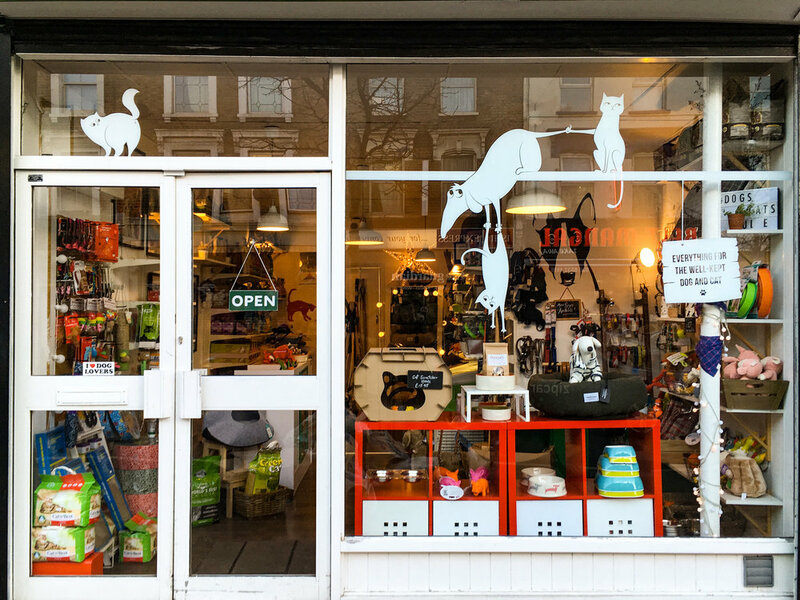 Plus, the exquisite inclusion of a cat’s bum hole, because really a window display isn’t a window display without the depicting of a cat’s bum hole. Thrilled to report footfall has increased significantly since the scene was installed. Here’s a photo of us looking happy about that.